You can activate “PSY-Framegear” monster effects in your hand even if you control a monster. If another Psychic monster you control is banished: You can add 1 “PSY-Frame” card from your Deck to your hand during the End Phase of this turn. You can only use this effect of "PSY-Framelord Lambda" once per turn. 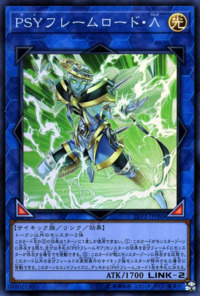 This is the first PSY-Frame Link Monster. This monster is PSY-Frame Multi-Threader equipped with what seems like two PSY-Framegear monsters (Shoulder pads and helmet, and greaves) that are not yet revealed. It is also the first Psychic Link Monster unrelated to either the Duel Terminal or the True Draco lore. This card has the arguably simplest Link Material requirements of all the Link Monsters that were introduced in LINK VRAINS Pack 2.